A roar went out like a big wave crashing through the woods. Everyone looked up; the birds stopped singing and the air prickled. All within the land knew that Leo the Lion was on the hunt! His mane was a vibrant orange, like the golden sun in the desert. His eyes were filled with fire. He was the largest, strongest, and fiercest beast around. He was the king. When war struck, Leo would carry the damsels in distress away to his cave. When peace lilted in, Leo would carry away travelers unawares. Anyone caught in his path faced unfavorable misfortune. Leo would kill anyone that came near his den, as well. He was a respecter of no one. The people in the land lived in utter dread of him. One day, Hercules came to save the people from this beast. He was on his first of 12 labors to become a god like his father. He did not know that Leo’s golden fur was impenetrable, but went forth in full confidence. Hercules wandered the woods seeking this fierce beast that he had heard of. But with his keen sense of smell, Leo found him first and the fight began. Hercules tried his arrows against this lion. In fact, he tried more than once, but could not pierce though the lion’s coat. So, he decided to wrestle the beast. 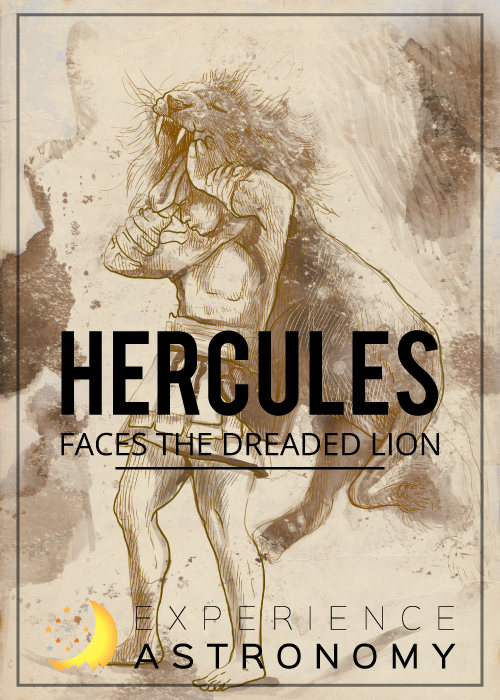 Hercules trapped Leo in his cave to challenge him in a fighting format he thought he had a chance at. They rolled and flailed about. The grass around them became flattened. Finally, Hercules got a good grip and held on for dear life. He tightened his hold, and after some time, he could tell that Leo could not breathe. Leo, the great beast, took his last breath and fell dead. The woods fell silent in awe rather than fear. All knew that the great beast was no more. 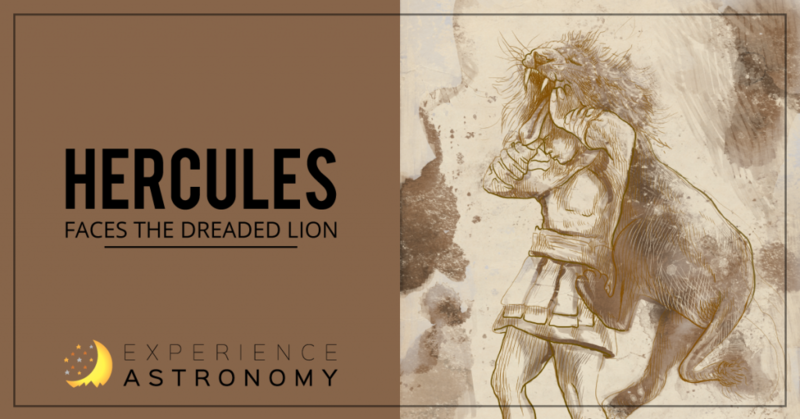 Hercules took one of the lion’s claws and skinned the beast. Then he put the pelt on and strolled away, proud of his mighty deed. Leo the Lion is one of the 12 Zodiac signs. Some say Zeus put Leo in the sky for his fierceness against his son, Hercules. This article is by Rylea, age 14, an Experience Astronomy student from Centralia, Washington.